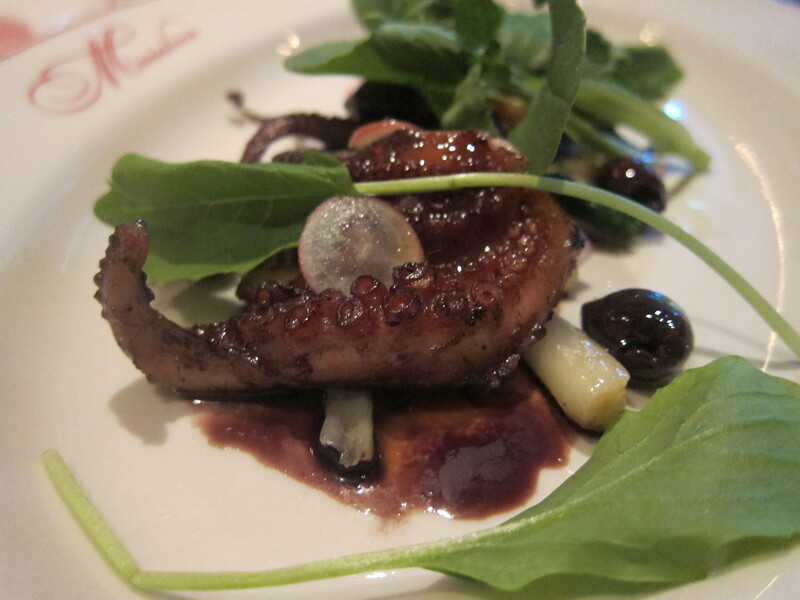 Maialino, another solid culinary outpost in the Danny Meyer restaurant empire sits on the ground floor of the lovely boutique Gramercy Park Hotel and faces the lush greenery (well, as lush as it gets in NYC) of the park itself. The natural light was actually one of my favorite aspects of sitting at the bar and enjoying my pre-prandial cocktail as I waited for my friends to arrive. 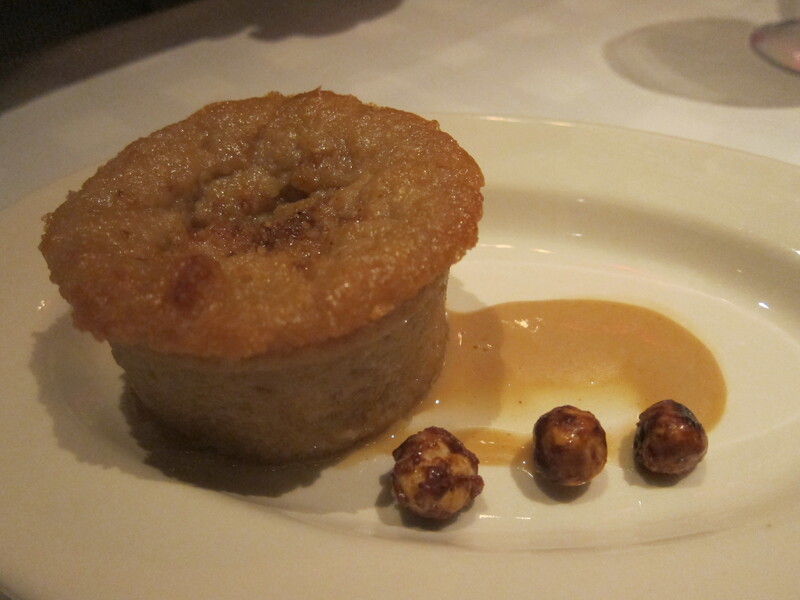 This was also one of my favorite aspects of the decor of another Danny Meyer favorite, Eleven Madison Park. I’m lucky enough to have tried Eleven Madison Park, Gramercy Tavern and now Maialino and hopefully I will continue expand my degustations of Danny Meyer spots, as they have never disappointed. 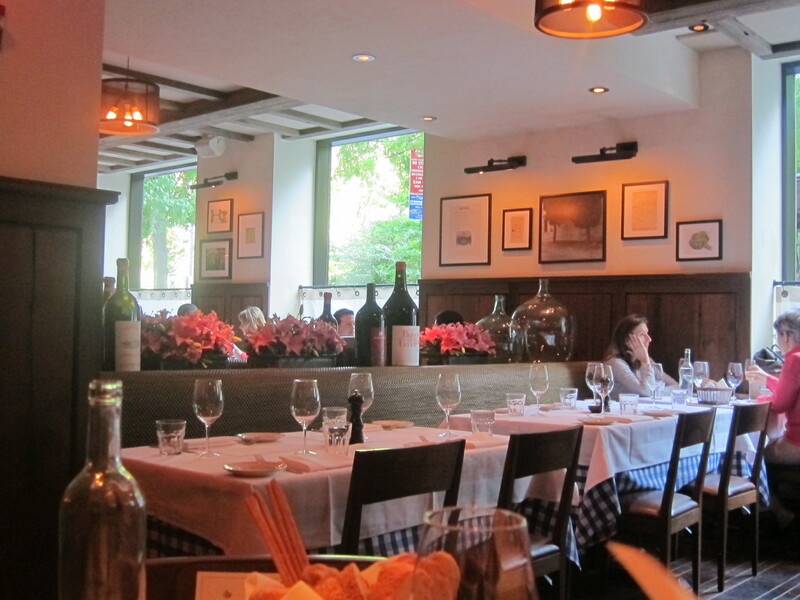 Designed by the Rockwell Group, Maialino tries to emulate the feel of a Roman trattoria but with a few upscale touches. The wooden floors match the wooden wall panels and reclaimed ceiling beams. Framed photographs adorn the walls. 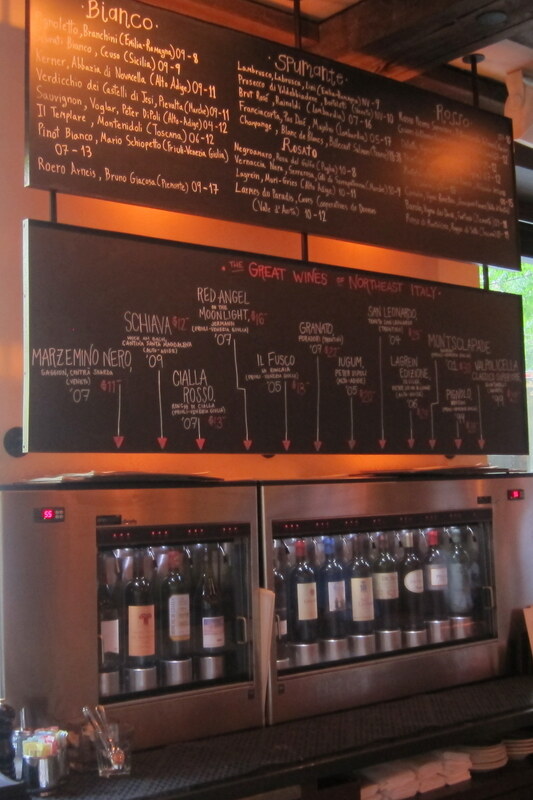 Bottles of wine and decanters add warm, finishing touches to the center dividers and shelves. 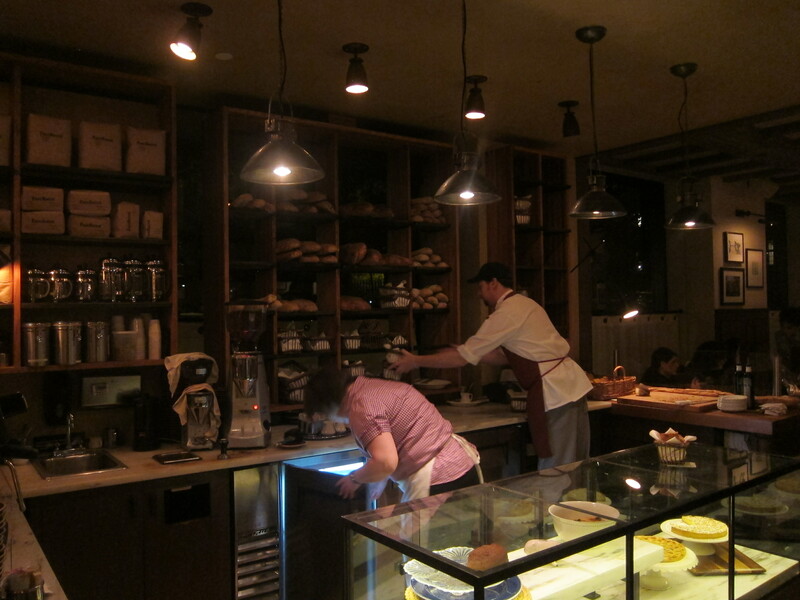 The kitchen is in view and you can see the servers bustling about the open bread station as well. The interior evokes a comfortable and sophisticated but not overly opulent atmosphere. (The Rockwell Group can boast opulent projects as well, such as the Marina Bay Sands Hotel in Singapore. It has also done rustic traditional such as the Ink48 Hotel in New York (home to Print restaurant) as well as a slew of other diverse projects). 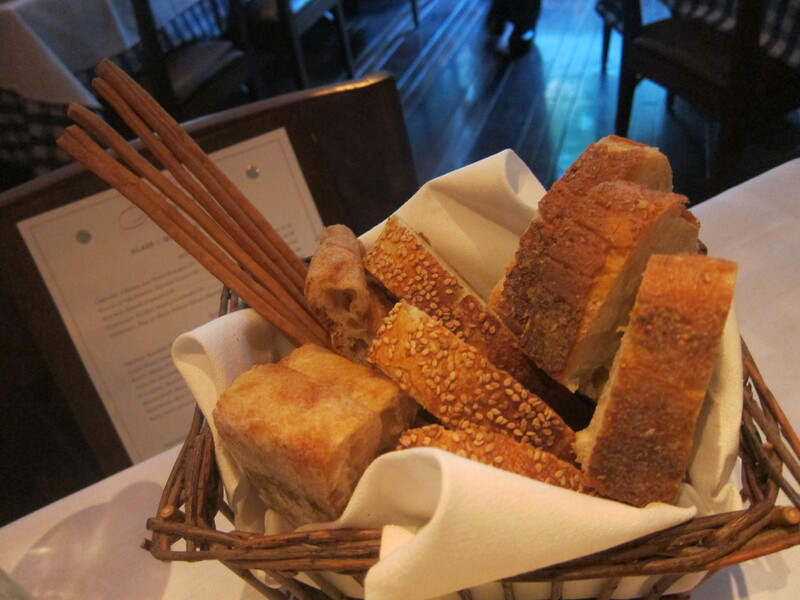 In terms of food, Maialino focuses on the simple style of a traditional cucina romana. The cuisine highlights locally grown produce such as artichokes, uses simple pastas and local cheeses like Ricotta (which we’ve actually made ourselves!) and Pecorino and garnishes typically with garlic and olive oil. My dinner companions and I ordered a couple of pastas because we had heard that the restaurant excelled at them, a few appetizers, and the Maialino, the namesake of the restaurant. I have to say that the the Maialino, the suckling piglet, was by far my favorite part. Actually it was the fatty crispy skin of the Maialino that was so finger-lickin’ good. 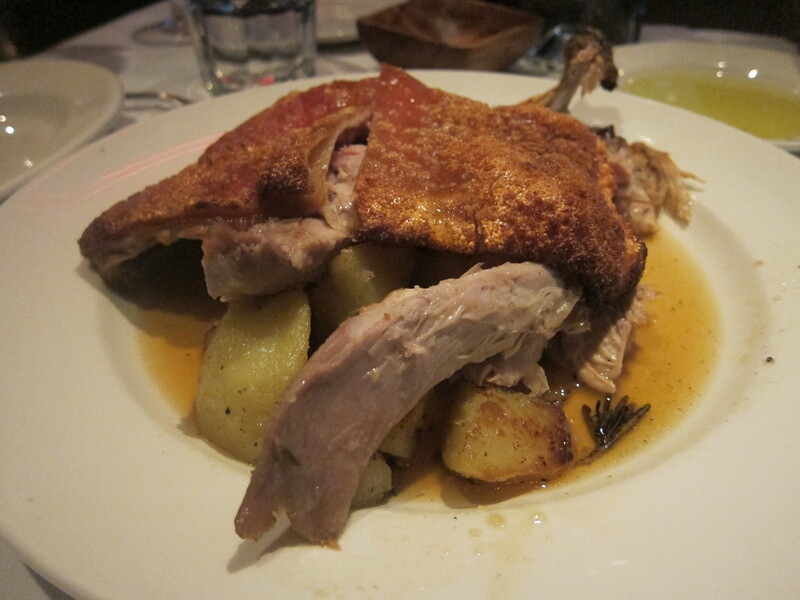 I have not tried the whole roasted suckling pig at the Hurricane Club (Jen says it is definitely not as good), or at any other NYC establishment for this matter, but the one served at Maialino can confidently hold its own, I am sure. I’m pretty sure I actually said aloud that I wanted to make babies with the mozzarella and I stand by my statement. This was freaking amazing. It was almost melt-in-your-mouth soft, but still with the slight hint of the rubbery chewy texture that holds those magical cheese balls together. 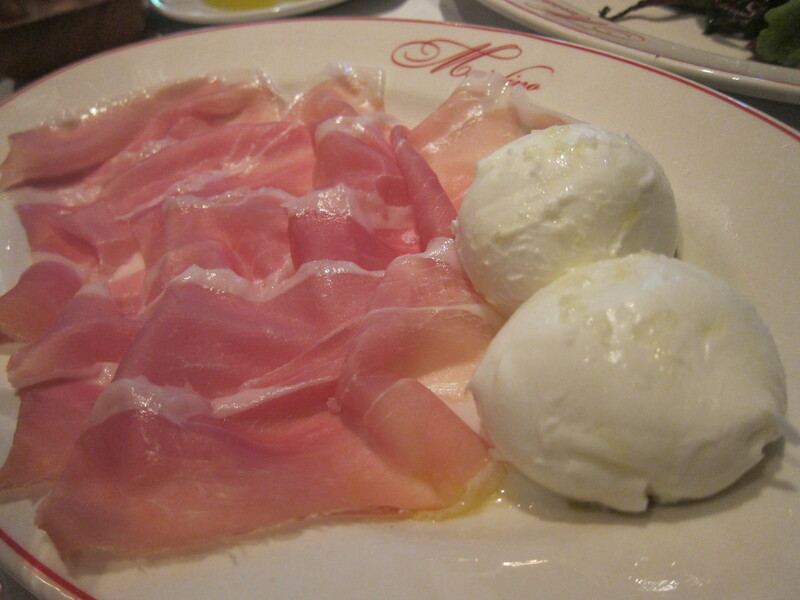 The prosciutto was great, but my favorite is probably Babbo’s. 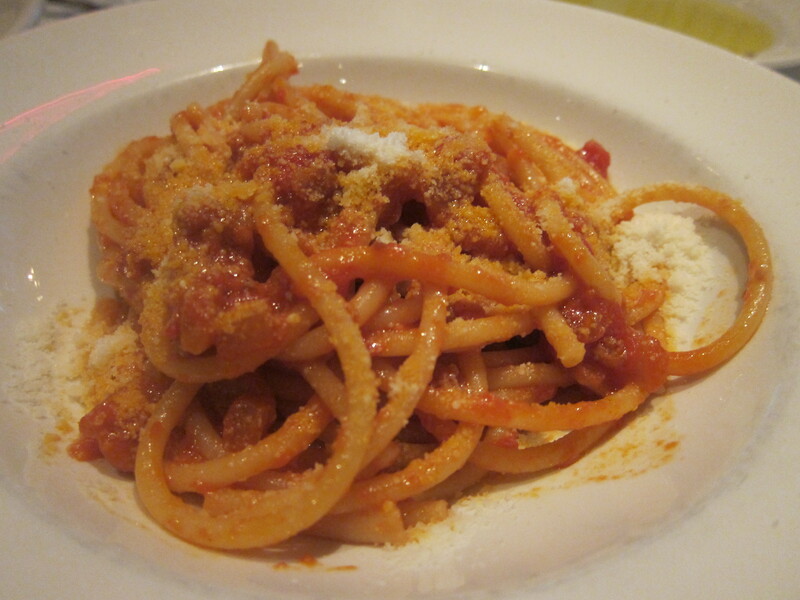 I think I am going to go totally against the grain here and be the only person who did not love pastas at Maialino. 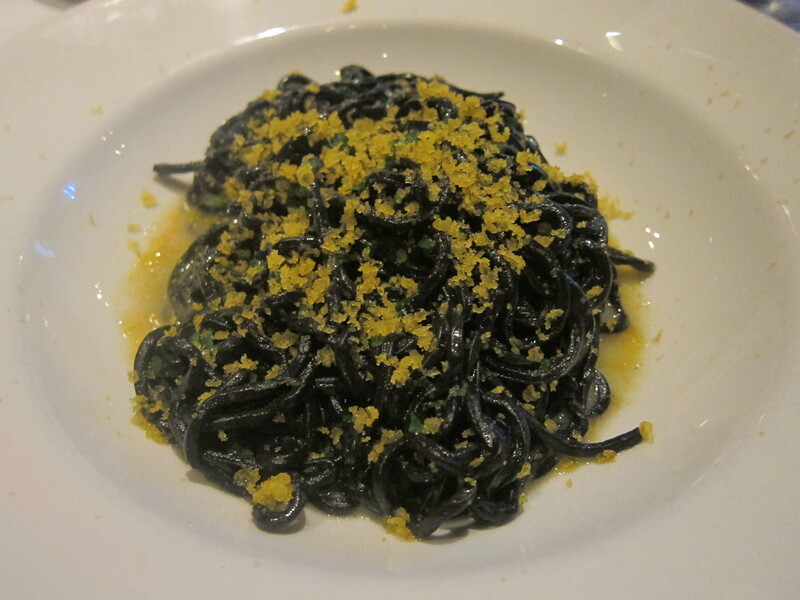 As a disclaimer, I am not a huge pasta fan in general, but I think the Black Spaghetti at Babbo is divine and despite being notorious for being overly salty, the selection of pastas at L’Artusi rocks my socks. But this squid ink was not just oversalted, but also tasted fishy, neither of which qualities I enjoyed. Same as above, I was not impressed by the pasta dish. It was too salty and I think didn’t have as much tomato and guanciale (which happens to be bacon made of a pig’s cheek or jowl) as I would have liked. Hello piggy! This suckling pig was so juicy and amazing and the skin so crispy I made sure to bring some home to Jen to taste. The juices had also run off during the roasting and infused into the potatoes underneath the pig which made everything amazing. 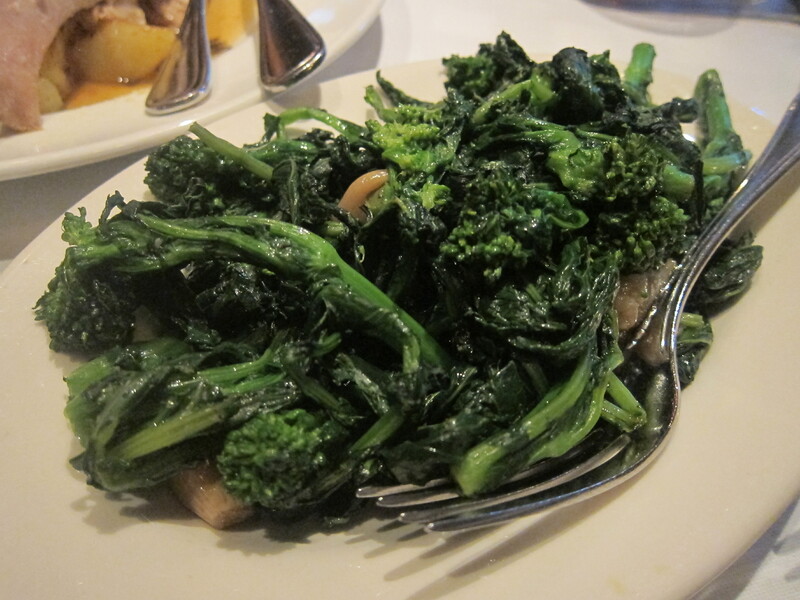 I guess you can’t really do much to broccoli rabe to make it too exciting. It will always be a healthy, bitter green and that’s all we can ask of it. This was decent, but the restaurant probably has better sides. 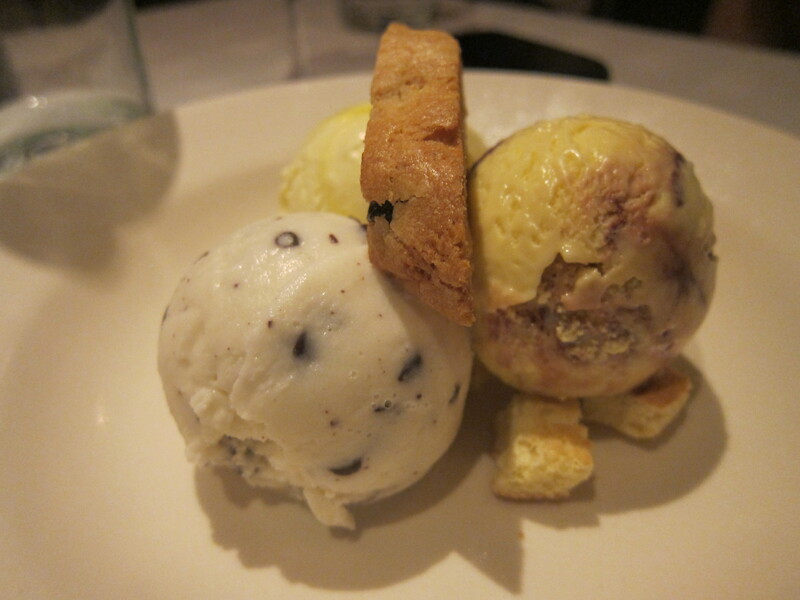 Never underestimate olive oil gelato. Or gelato in general. 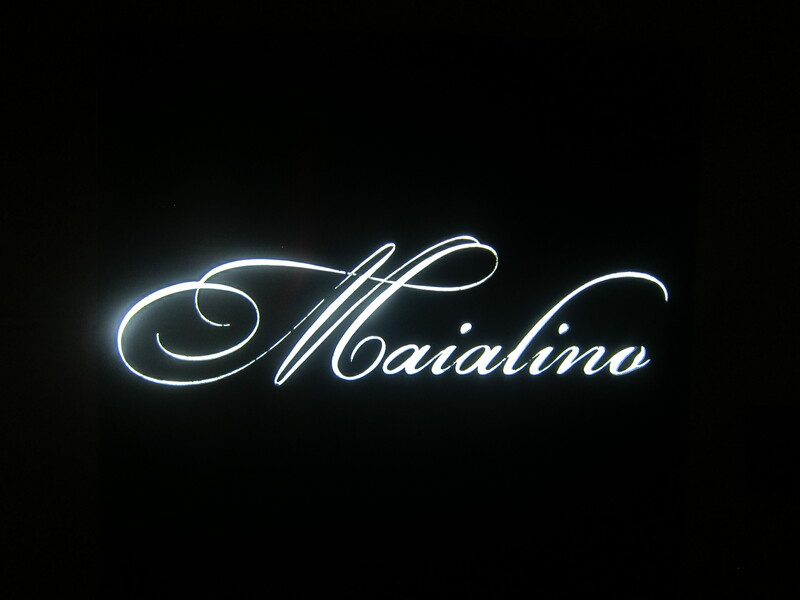 my FORMER favorite italian restaurant use to be maggianos… UNTIL i tried maialino. granted, the food is very similar (both serve pasta) and maggianos does offer crayons for me to draw (a big bonus! ), but maialinos is still the better pick. along with the food, the service was spectacular. the waitress was kind enough to shuttle numerous napkins my way since i was sweating so much (what can i say, i’m a little obese so my sweat glands fire uncontrollably.) but overall, i would rate this place a B+ to A- based on food, soda selection, and softness of napkins. i’m definitely looking forward to going back soon! i recently moved to manhattan and was hoping to find a maggianos too – the spaghetti carbonara is amazing! while i was thrilled to find an olive garden, i was a bit devastated there was no maggianos. but then i ate at maialinos and i gots to tell you, its not as good, but its a close second! next up – eleven madison with two good friends! hopefully its just as good!